Welcome to Riu Palace Paradise Island! The Riu Palace Paradise Island Resort is packed with fun for the entire family. It is simply luxurious and offers a great thrill of a vacation. What can go wrong in the Bahamas? The Bahamas is just a fantastic place to vacation. Whether you visit on a family Caribbean cruise or you fly to a Bahamas inclusive resort, your family will have an unforgettable vacation. Past guests at the Riu Palace Paradise Island give it an overall, excellent review. Some describe their experience as: "Beautiful!" "Beautiful beaches - hotel - a few complaints!" "Paradise Island Home!" "Just ok." and "Absolutely loved it!" This all inclusive resort is one of the top vacation spots for couples, families, and groups of friends visiting The Bahamas. The greatest thing about visiting any vacation spot in the Bahamas is that the weather is pretty warm all year round. Your family can vacation in the Bahamas at anytime during the year! Like most places in the Caribbean in general and in the Bahamas in particular, the weather remains warm - but hot during the summer - all year round. 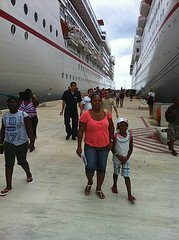 Consequently, visitors frequent the Bahamas at anytime during the year. The summer days are quite humid and can be very hot, but are sometimes cooled by rainfall. 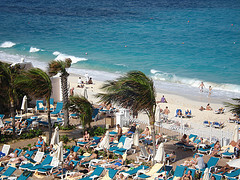 The Bahamas are also threatened by hurricanes during the Atlantic Hurricane Season from June through November. During the hottest months of July and August, the highest temperatures remain in the 90's. And, during the "coldest" months of January through March, the highest temperatures remain above 80 degrees. Temperature at nights may dip to the 60s. For those who love the beach, the surface water remains in the 70s. The rainiest months are from May to October, when the islands can expect about 6 inches of rainfall each month. You can expect overall great vacation weather whenever you visit the Riu Palace Paradise Island Resort. Riu Palace Paradise Island All Inclusive is located on the beach in Paradise Island, close to Versailles Gardens, Cabbage Beach, and the Atlantis Aquarium. Other Points of Interest near this all inclusive property include Fort Fincastle and Aquaventure. Property Features: This property is all inclusive. Rates include meals and beverages at on site dining establishments, taxes, and gratuities. Charges may be applied for dining at some restaurants, special dinners and dishes, some beverages, and other amenities. Dining options at Riu Palace Paradise Island All Inclusive include 3 restaurants. A swim up bar, a poolside bar, and a bar/lounge are open for drinks. Room service is available 24 hours a day. Recreational Amenities include an outdoor pool, a spa tub, a sauna, a fitness facility, and a steam room. Spa Amenities include spa services, massage/treatment rooms, beauty services, and a hair salon. This 4.0 star property offers small meeting rooms, audio visual equipment, and business services. Wireless Internet access is available in public areas. This Paradise Island property has event space consisting of banquet facilities and conference/meeting rooms. Wedding services and tour assistance are available. Guest parking is complimentary. Additional Property Amenities include multilingual staff, gift shops/newsstands, and laundry facilities. 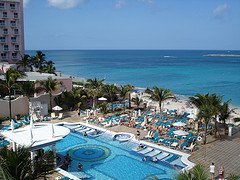 Guestrooms: There are 379 guestrooms at Riu Palace Paradise Island All Inclusive. Balconies offer ocean views. Coffee/tea makers and minibars are offered. Bathrooms feature shower/tub combinations, double sinks, complimentary toiletries, and hair dryers. In addition to desks and in room safes (accommodate laptops), guestrooms offer direct dial phones with voice mail. Televisions have satellite channels. 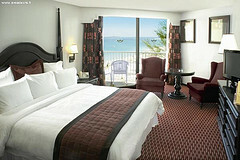 Air conditioned rooms also include complimentary bottled water, ceiling fans, welcome amenities, and irons/ironing boards. Guests may request extra towels/bedding and wake up calls. Find the best deal, compare prices, and read what other travelers have to say. 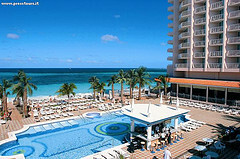 As noted above, the Riu Palace Bahamas is located on Paradise Island. The preferred airport for Riu Palace Paradise Island Resort is the the Nassau International Airport. The resort is located about 16 miles from the airport. Several international airlines from the U.S., China, Europe, the Middle East and elsewhere visit the Nassau International Airport. Your family should easily find a flight to the Bahamas and to your inclusive resort on Paradise Island, without having to sweat too much. Some hotels in the Bahamas offer transfers, so check before you fly. If that fails, then your family will need to arrange for transfer from the Nassau International Airport to Riu Palace Paradise Island Resort. Taxis are the most economical and fastest way to travel from the Nassau International Airport to Paradise Island. There are many taxis available outside the "International Arrivals" area. You can expect to pay about $18 - $25 (subject to change) for your trip. The taxis are metered, so ensure that the driver activates the meter or confirms what the fare will likely be before leaving the airport. Have You Stayed at this Resort? Do you have a story to share about this resort? 1. Paradise Island Harbour Resort All Inclusive: Find the best deal, compare prices, and read what other travelers have to say. 2. Sandals Royal Bahamian Spa Resort: Find the best deal, compare prices, and read what other travelers have to say. 3. Viva Wyndam Fortuna Beach: Find the best deal, compare prices, and read what other travelers have to say. 4. Breezes Resort Bahamas: Find the best deal, compare prices, and read what other travelers have to say. Use the TripAdvisor Search Box below to continue your search for other inclusive resorts in Paradise Island, Bahamas. I believe that you and your family will have lots of fun. When you get back please share with us your experience at the Riu Palace Paradise Island Resort.